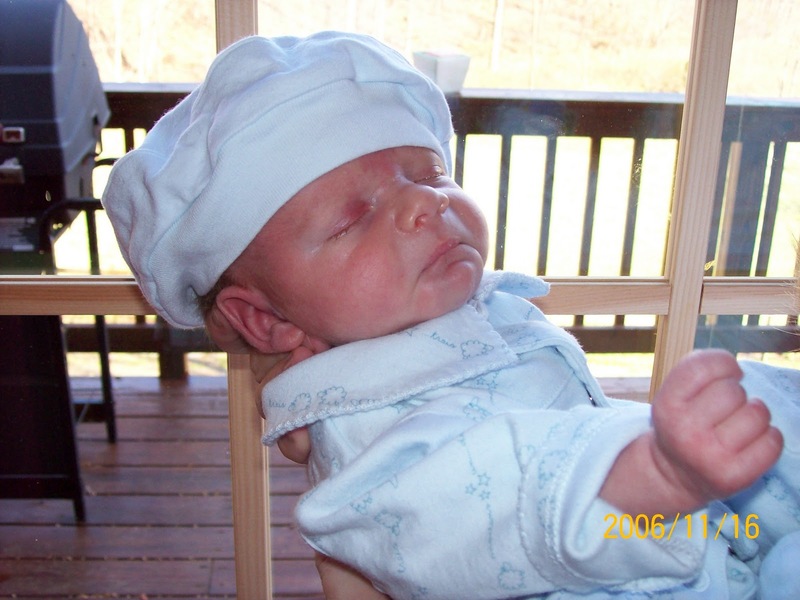 The first time Pierce projectile vomited he was 3 weeks old. I was walking down the steps with him, having just fed him, and he made this weird choking sound just prior to a Mach 5 spew of vomit exploding from his mouth. I stopped in my tracks, shocked, as curdled milk dripped down my shirt, my pants, and pooled on my baby. Having spent my high school years babysitting, I knew that babies spit up, but nothing like this. For several days he continued to vomit like this, and I wondered if he had the stomach flu. I called the doctor. They had me put him on pedialyte to try to settle his belly. A few days later his vomiting reacher a lower level of projectile, although he was still spitting up immense amounts. We were assured that this was normal. Pierce spit up so much that we had clean dish rags on every arm of the couches, on every counter, always something handy to mop up the vomit. If we were going out, we would have multiple changes of clothes, and sometimes I'd put on two or even three bibs, so I could just peel one off after he threw up on the first. We hoped that starting solids would help. We'd heard that it would. So come four months, we started adding rice cereal to expressed breast milk. Pierce liked it, but he continued to throw up. We discovered that orange foods like carrots set him off, so we stayed away from those. When Pierce got 'set off', he'd vomit violently over and over again. Like stomach flu vomiting. Only he didn't have the stomach flu. We tried all the usual. Elevating his mattress. Feeding him sitting up. Gripe water, colic tablets, gas drops. None of it made any difference, and we were continually reassured that things would let up once he was sitting up, crawling, walking. Every single doctor checkup I mentioned the vomiting. But because Pierce was what they called a 'happy spitter' who didn't cry from the reflux, they weren't inclined to treat it. That is, until his weight completely fell off the charts (and he was small to begin with, born at 5 lbs. 11 ounces). That day, his 9 month checkup, I'd gone in resolved to demand something for him. We had tried Zantac, but it didn't help, and I hated forcing my screaming baby to swallow the medicine that smelled like hard liquor. I knew that there was more to the situation than our pediatrician had realized. During the checkup, Pierce cooperated by projectile vomiting SEVEN times during the 30 minute appointment, as I continually mopped up the mess with my arsenal of dish rags and Wet Ones. The pediatrician, alarmed, said, "He does throw up a lot!" In retrospect, I should have pushed harder for Pierce earlier on. Sometimes moms have to be a strong advocate. I didn't know, and I felt like a failure. We left that day with a referral to a gastroenterologist, and a prescription for Prevacid. I held my undersized, sour-smelling 9 month old close, hoping and praying that he was going to be alright. I bet you were never so happy to have him vomit then right there in the office. I had a boy that did this along with being colic.. I took him to a chiropractor and it quit. I was happy and Rich was a happy baby. Hope Pierce didn't have to go much longer with this and got help quick..
You and JP are together in this blogging mmmmm? She has a continued story going on right now too. Poor little dear. I didn't know about this condition. How terrible (for him AND you!) Very scary. Am hoping Part 2 has better diagnosis and treatment! OMG! How horrible for the little guy. Although it sounds horrible it was a blessing that he threw up so much while in the doctor's office. Oh my...our daughter had similar issues. We were on some other med though...liquid zantac maybe? Anyhow, it was not fun...thank goodness we had a steam cleaner. We used it daily! That would be scary as a mom. The biggest thing is not knowing why something is happening. You weren't a failure though! NEVER feel like a failure as a mother. IF there were such things as Motherhood 101, 102, 103, 104...etc! and we had even a reason to say we failed THOSE courses....BUT NO ONE tells us how or what to do. We wing it. And do the best we can. And you DID! Oh how awful--to feel so helpless and have no idea what to do. I've never heard of a baby with acid reflux that bad. Poor Pierce! And poor you! I wouldn't had been able to stomach cleaning that up that many times a day without throwing up myself. Oh no poor little guy & poor mama too. My niece was on Prevacid when she was a baby too. I remember the first time I heard her trigger sound & my sister jumped to catch what was coming out. NO fun! I hope he is doing better! I agree with Anonymous, many doctors do tend to think we exaggerate our kids symptoms. I'm glad your doctor finally witnessed it and took it seriously. Good for him for showing the doctor exactly what was wrong! I know the story well. We tried Axid, and then Prevacid after that when she outgrew the initial dose. She was a screamer, though. Argh - the mess and the screams. My ears, my eyes, my heart! New follower here!! You have a fantastic blog. Check us out and follow back! we dealt with pretty significant reflux here as well. prevacid was really helpful for ella and zoe, and we had to thicken their breastmilk and formula until they were 9 and 10 months old (which was so expensive but so worth it). but because they were identified with reflux when they were still in the nicu we never dealt with as much vomiting as you did. what a deal!! Misery. Oh, you poor thing. My friend is having a time with her daughter. I'll forward this link to her, so she knows she's not alone. My new grandson who is 3 months old has this. And they are trying different medicines. I am going to forward this to them. Thanks. SO glad he could show them just how bad it was!! Never understand why Dr's don't listen to the parents so much!